Aklufi’s Hearing was set for tomorrow at 8:30 am in Department 52 with Judge Fisher. However the Case Docket states that the Hearing set in Department 52 has been “Vacated”. A new Hearing has been set for 9:00 am in Department 64. Judge John Molloy will be the new presiding Judge over the Aklufi’s Criminal Trail. Alkufi was part of the Expendable Seven that were Indicted after the FBI and Riverside County D.A. Raids on April 22, 2015. Although the other Crooks have plead out and Aklufi has already lost his License to practice Law in the State of California, Aklufi refuses to plead out because he knows that the Riverside County D.A. can never take him to Trail without implicating themselves. In 2005 Riverside County District Attorney Ron Pacheco Tried and Convicted Judy Bingham, a 58 year old white woman, for ‘Making a Terrorist Threat’ because Bingham was exposing the same illegal activity in Beaumont that the D.A.’s Office is now pretending to prosecute. In July, 2017 Judge Fisher ‘awarded Alan Kapanicas $100,000 to be paid by the Citizens of Beaumont. Kapanicas plead Guilty to Fraud and Embezzlement a month later. At the May 18th Hearing Judy Bingham and I were denied access to Aklufi by Judge Fisher’s Bailiff. A Complaint was submitted to the Courts as well as a Public Records’ Request for the documentation ordering the Courtroom to be sealed. 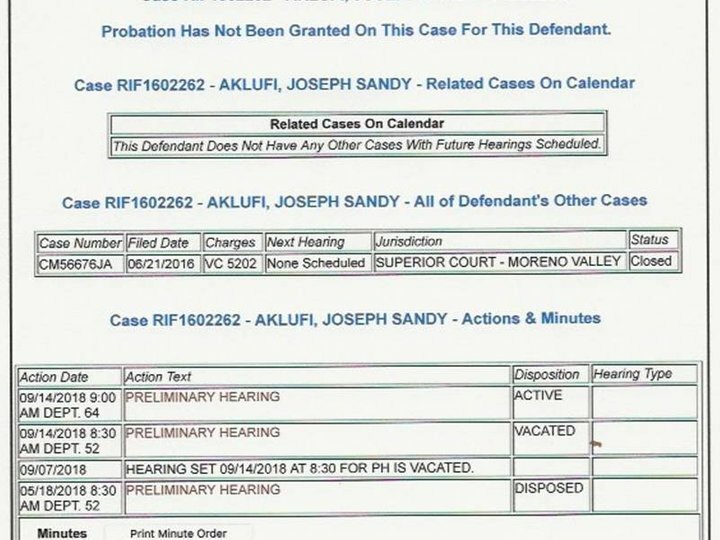 Hearing in the Criminal Case of former Beaumont City Attorney Joseph Aklufi will be held Friday, September 14, 2018 at the Riverside County Superior Court, Department 64, located at 4050 Main Street, Riverside CA. 92501.